(CNN) -- Tuvalu, the fourth smallest nation on the planet, has announced it aims to be totally powered by renewable energy sources by 2020. Tuvalu hopes to set an example to bigger nations by relying totally on clean energy by 2020. Located between Hawaii and Australia, the tiny Pacific nation is one of the world's climate change hotspots and many believe it is already seeing the negative affects of rising sea levels. The highest elevation on the island is just 4.5 meters (14.8 feet), and king tides have become increasingly damaging over the past 10 years, threatening the homes and livelihoods of its 12,000 inhabitants. The government of Tuvalu is working with the e8, a consortium of 10 energy firms from the G8 nations that was set up after the 1992 Rio Earth Summit as a non-profit organization. The Tuvalu government estimates that it will take around $20 million in investment to reach the goal of 100 percent clean energy by 2020. The first stage of the project has seen the roof of the country's largest football stadium covered in solar panels, which supplies 5 percent of the electricity needed by the nation's capital, Funafuti. According to e8 figures, after 14 months in operation the solar stadium has reduced consumption of generator fuel shipped from New Zealand by 17,000 tons and saved 50 tons of CO2 from being released in the atmosphere. A further benefit is the reduced risk of diesel spills around the atoll's reefs. "There may be other larger solar power installations in the world, but none could be more meaningful to customers than this one," said Takao Shiraishi, general manager of the Kansai Electric Power Company that helped implement the scheme. 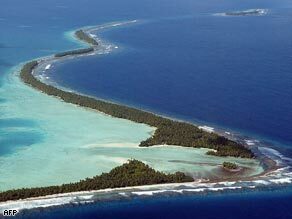 "The plight of Tuvalu versus the rising tide vividly represents the worst early consequence of climate change. For Tuvalu, after 3,000 years of history, the success of UN climate talks in Copenhagen this December may well be a matter of national survival," he said in a press statement. The next scheme is building a solar power system for a secondary school on Vaitupu, one of the outer islands. "We thank those who are helping Tuvalu reduce its carbon footprint as it will strengthen our voice in upcoming international negotiations. And we look forward to the day when our nation offers an example to all -- powered entirely by natural resources such as the sun and the wind," said Kausea Natano, Tuvalu's minister for public utilities and industries.